1850 Maryhill Road, Glasgow. G20. 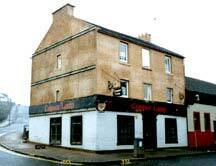 This pub was formerly called Garven’s and is now called the Maryhill Tavern. Situated at the corner of Duncruin Street formerly known as Hill Street. The history of this old Maryhill pub can be traced back to 1881. Wine and Spirit merchant William Garven was trading from these premises, the address then was 168 Main Street, Maryhill. In 1889 Mrs Jane Garven was licensee, her son John was in partnership with John G Miller and traded under the title of Miller & Garven, 73 Virginia Street, Glasgow., possibly a whisky broker. Both Jane and John lived at the same address, 1 Mary’s Place, Maryhill. In 1937 Andrew Ross a well known and respected Glasgow wine and spirit merchant was licensee, Mr Ross also owned the Andros Bar, now Wintergill’s on Great Western Road and the Halt Bar on Woodlands Road. After the Second World War Mrs Martha Campbell was licensee, she continued until the 1960s. James Dunsmore took over as licensee in 1972. From the First & Last Bar on Maryhill Road to the other end of New City Road there was a total of 44 public houses, that was in 1899. Main Street had 11 Pubs. Wyndford Street had 3 Pubs. Gairbraid Street had 5 Pubs. New City Road had 25 Pubs. This long stretch of thoroughfare was then divided into four parts Main Street, Maryhill then continued to Wyndford Street from under the Viaduct then continued to Gairbraid Street then to New City Road from Queens Cross to St George’s Cross. New City Road continued down to Garscadden Street.